Floor toilets, cold water, strange shoes – and a lot of friendliness in another world. – Weltherz e.V. With the words “There is no real toilet” I am picked up at the Kilimanjaro airport in Tanzania. So my worst idea really came true. Basically I had no idea what to expect during my one-week stay in a Tanzanian orphanage. Finally, only three weeks before I had decided to start the adventure and to accompany my school friend Denise, the initiator of Weltherz e.V., on her visit. When I now hear this sentence, I am suddenly no longer so sure how adventurous I really am. But now I can’t turn back. So close your eyes and go through. In a nutshell: If you turn back our living conditions in Germany by half a century, you come out in Boma Ng’ombe in Tanzania – for me, born in the late 80s, a completely different world. Running, ice-cold water for showering is only available on a single evening. On the remaining days buckets must be sufficient. At the beginning I am completely overwhelmed with the floor toilet – for me absolutely new territory. For the 18 children and three adults in the Hope Home, the simple conditions are part of everyday life. 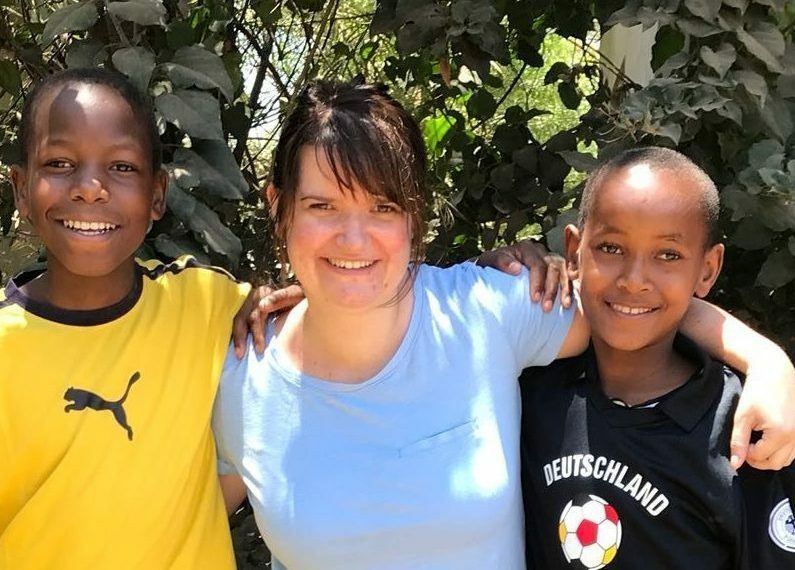 Sara and Joseph, the operators of the orphanage, care selflessly for their own three and the other foster children and orphans. The well-being of the children, whom they all call mum and dad, always comes first for them. Nevertheless, there is a lack of many things that we take for granted: clothing is worn out, pyjamas or even a fridge are not available. Everyone is cooked on a single wood stove, which is why the preparation of dinner can sometimes take two hours. And if Sarah and Joseph can’t pay for the electricity, they simply turn it off. Even two removals were necessary this year – because they couldn’t pay the rent. The children do not allow themselves to be put off by all this. Never before have I met such attentive, courteous and hardworking children. Everyone is helping here together: The older ones take care of the younger ones. They make sure that they eat, are bathed and dressed. They carry the sleeping children to their beds, help with laundry, cooking and washing up. What impresses me most is that the children share everything fraternally. Sweets brought by us are distributed fairly, even to us. This also applies to clothing and shoes. The shoes that remain are worn, “mine” and “yours” do not exist. We use the time on site to play and learn with the children. In addition to bouncy rubber and ball games such as football or badminton, English is also on the programme. With Memory we learn the vocabulary of the motives and with the older children additional grammar. In return, the children teach me a few words of Swahili, which enable me to do the simplest shopping on my own. Since then the children call me either “Miss Nina” or “Teacher”. When visiting the “swimming pool” – consisting of a pool and a playground – swimming exercises with all children are on the program. Since there are no bathing clothes for the children, the girls jump into the pool fully clothed and the boys with their worn underpants. I was quite surprised to find “my” flip-flops in the swimming pool. One of my new family members had probably borrowed them. Beside the swimming pool the purchase of the school bikes is the second highlight during our visit. Buying bicycles with seven children is not so easy because we have to find the right size for everyone. In the German way Denise tests every single bike for its riding ability. While shaking their heads, the sellers change some tires or tighten the brakes. Driving ability is a matter of definition. At home, the children polish their new wheels to a high gloss. At night they are cleared into the house so that they are not stolen. With the help of the bicycles, the Hope Home saves the money for the school buses. It is not a matter of course that the children can play in the Hope Home and even attend school without any worries. The individual fates I’m getting to know these days are very moving. A 15-year-old girl should be forced to marry. Many children lived on the streets or were rejected by their families. Both parents were beaten to death by a pair of siblings on suspicion of theft. To see these children play, laugh and live so carefree despite their experiences was definitely worth the trip. It was a unique experience, surprising and moving. And finally I managed the Toilette. Nina Roßberg went to school with Denise Benz, initiator of Weltherz e.V., and was so moved by her reports that she immediately packed her suitcase herself to see the whole thing on the spot.